Potatoes are considered to be a comfort food when roasted, baked or mashed. It is not a seasonal veg as it is harvested somewhere every month for a year. Potatoes are very popular food source but most of us eat it in the form of french fries or crispy chips. But when it is roasted, baked or mashed, it becomes a fine healthy food for both adults and kids. 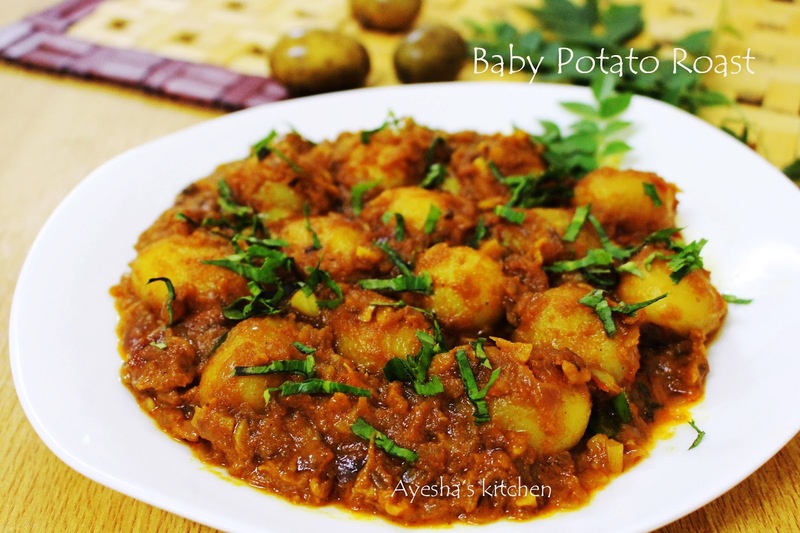 Baby potatoes are a variety of potato family which is rich in various health benefits and is visually appealing when added to the curry. Here I made this roasted baby potato gravy as a side dish to chappati which gives a fine combo. There are some recipes which I often try with normal potatoes. 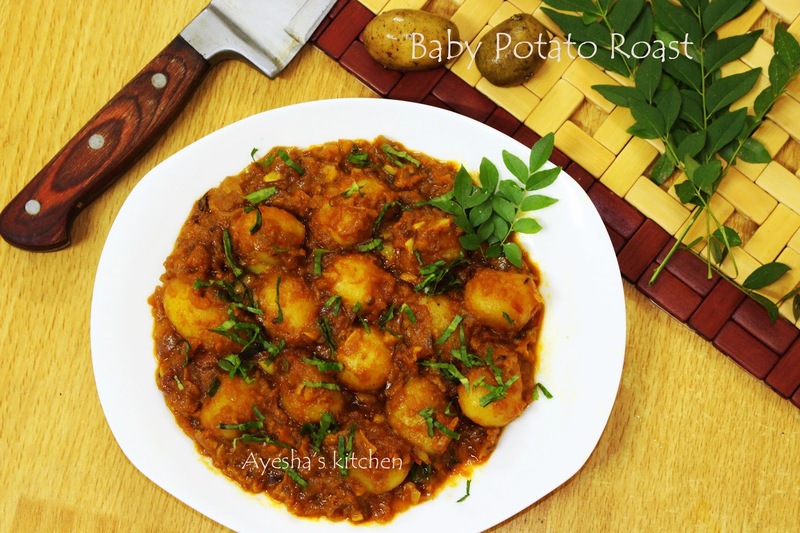 But this is quite different as I used baby potatoes in this gravy which gives an inviting texture to the whole dish. For sure, it gives a fine combo when served along with dosa, poori, chappathi and with hot rice. Try this recipe and do let me know the feedback. 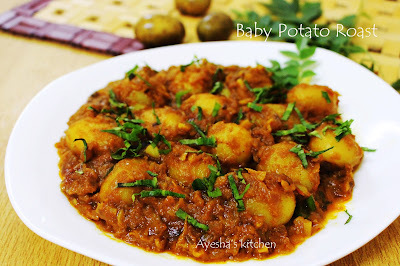 So let's see how to make baby potato roast / Indian spicy curry with baby potatoes. Cook the baby potatoes with enough salt water until done without peeling. When done, let it cool and peel the skin. Heat a pan with 1 tbsp of oil and toss the baby potatoes for few minutes until it changes its color. Set aside. Meanwhile, heat a wok with some oil and saute the finely chopped onion until golden in a medium flame. When done, add green chili, ginger garlic paste, fennel seed powder. Saute until raw smell goes off. Then add pureed or crushed tomatoes to this gravy and cook until the oil floats on the top. It is the real consistency. When done, add coriander powder, chili powder, turmeric powder, garam masala powder and salt to this gravy. Combine well for 2 minutes on a medium flame and add half a cup of warm water to the roast and let it cook for few minutes until thick gravy (for curry, u can add more hot water). When done add the roasted baby potatoes to the gravy and cook until the oil separates. Garnish with methi leaves crushed, curry leaves and chopped coriander. Serve hot with chappathi / poori and hot steamed rice.